In my experience, there is not much overlap between the so-called “Greek system” (i.e., sororities and fraternities) and a college’s cycling team. Cyclists tend not to drink (at least during the season), and Greeks tend not to ride bikes. Thus, their paths almost never cross, except in class. This tale, which I just realized is a quarter of a century old, explores a rare exception to this rule. You know that old stereotype that all sorority girls are luscious babes? Well it’s true. And you know the one about how they’re all airheads? Well . . . who am I to judge, especially when they feed me? And what are they feeding me? Spaghetti, of course. I’m a cyclist, so that’s pretty much all I eat. You may wonder how it came to pass that I’m dining at a sorority house. Well, wouldn’t you, if given the chance? My bike team pals and I are here for a benefit dinner. The sorority is raising money for a cyclist who was hit by a drunk driver and faces $1 million in hospital bills. Fortunately, I’m here with my teammate Randy, who is the right guy to hang out when you’re at a sorority house. He seems to know all the girls. I thought maybe this would lead to some introductions, but he’s too busy flirting. Myself, I’m too busy not flirting to actually flirt. I occupy myself noting the things that make this unassuming building a true sorority house. (Besides the hot chicks, of course.) For one thing, the lifestyle is really structured—look at all the charts on this bulletin board. Up top, we’ve got the “OVER 3.75 GPA” listing, and below that, the “OVER 3.00 GPA” listing. At the bottom is the voluminous “NEEDS MOTIVATION” list. Oooh, I’d hate to be on that one. Kind of like being in stocks. There’s another chart on the wall: “WHAT’S IN/WHAT’S OUT.” The term “girls” is out, while “women” is in. The rest of the guidelines seem to concern the complicated political structure of the sorority, so I have no idea what they mean. Anyway, boys will be boys, and we’re coming up with a few really good guidelines of our own, which I can’t share with you. The cooking is going real slow, so while we’re waiting in the hall, some of the sisters bring out Kool‑Aid and Honey Grahams. The Kool‑Aid is the standard summer camp mass-consumption recipe—one package of mix to ten gallons of water—but I’m really enjoying the graham crackers. They make me feel about ten years younger, since ten years ago is the last time I had them. I can see by the look on the girls’ faces that the sorority motherhood training is working. But as beautiful as these maidens are—and believe me, they are beautiful—nobody can serve up the graham crackers quite like a real mom. My friends and I are getting extra graham crackers. That’s because we’re wearing our “UCSB CYCLING” sweatshirts. I’ll bet you that each and every one of these girls is envisioning herself in one of these sweatshirts; that’s how cool they are. See the guy in the “Top Gun” aviator jacket? At over $200, it’s no match for what we’re wearing. These sweatshirts testify that yes, we are actual bike racers. Each day we live and breathe cycling with undiminished passion. And it is this passion that the girls want a piece of. In the dining room, a girl is standing on a chair, shouting at everybody. I guess she’s the supervisor. “Sisters can’t eat!” she yells at two other girls. I think about asking, “Is that because of the sorority dieting policy?” but think better of it. Suddenly, I see a sign on the wall: “LOAD YOUR PLATE HIGH CUZ IT’S ONLY ONE TRIP THROUGH!” Oh my god, I’ve been had. I’d heard it was all you can eat! The other diners have to stand there in line awhile longer waiting for the next batch of spaghetti, but I’m sure they’re not angry. 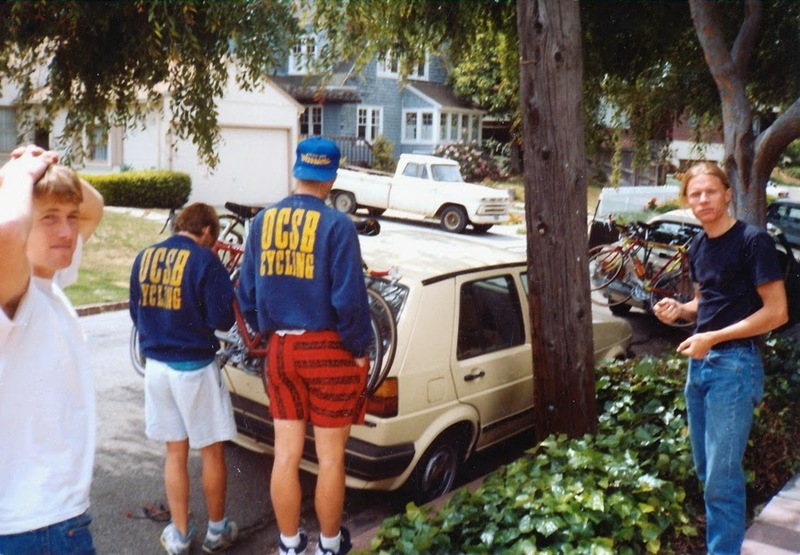 They know my friends and I are representing the UCSB Gauchos in the West Coast Collegiate Cycling Championships this weekend. We command a lot of respect on this campus. In fact, if you look at the girls carefully (which you’ll do anyway, if you’re male), you can easily see how smitten they are. It takes a lot of guts to tackle such a big plate of spaghetti, I know. But hey, I rode today. Does it seem like a lot of the girls have left? Yeah, they probably went out front to see if we rode our racing bikes here. Girls just dig our bikes. I saw this one eyeing my Dura-Ace eight-speed derailleur the other day, and I could tell she wanted to talk to me but was just too shy. That’s normal; we cyclists are so much bigger than life, our admirers get overwhelmed sometimes. Speaking of cookies, that’s what we raid next. It’s really crowded up there, and I’m trying to get what’s mine when everybody starts laughing. “What happened?” I ask. This dude answers, “Some geek just ran into the sliding glass door.” Dammit! It’s Randy! I feel really bad for him ... after all, I did that once. But the door I ran into was a lot cleaner. Boy, I hope he’s okay. I guess he got caught up in all the excitement. As we’re eating our cookies—Randy and I got enough for everybody—a girl walks by in some really interesting faux-cycling shorts. Most faux-cycling shorts look almost like the real thing but lack the chamois pad. But this girl’s shorts differ further in that they’re really short. Really, really short. One of the girls at our table says, “Oh my GOD! Look at those shorts! Those are so cute!” I know she likes them, and well, I do too. “Oh my GOD!” I echo her. Why does it sound so different when I say it? Language sure is strange. The guys are all laughing. She is not. But hey, it’s cool. I can tell she digs me. Of course she does—I’m a cyclist!